Each year YWAM Publishing produces the Personal Prayer Diary and Daily Planner. Selecting topics and writing articles months or even a year in advance of publication can be a difficult task. Simply put, we don’t know what exactly we should be instructing people to pray about in the future. We do our best to research and write relevant articles, but in the end we feel highly dependent on God to guide us in this annual process. This year I had the experience of having a topic divinely dropped into my lap. Our editorial department had just begun the process of selecting topics for the 2013 Personal Prayer Diary. On the weekend, while I was shopping at a local bookstore, a book caught my eye. I don’t often browse new releases, nor do I often look at political books, which this appeared to be. But I picked up the book anyway and decided to buy it. I began reading about North Korea’s prison camps in the book Escape from Camp 14 by Blaine Harden. About a week later I was driving to the office, stuck in traffic on the freeway north of Seattle. Normally I don’t take the freeway to the office (I have a short commute), but this particular morning I was coming from an appointment in another direction. I flipped on the radio and began listening to a program on NPR, not knowing what it was. The discussion I heard sounded oddly familiar, and soon I realized they were talking about North Korea. In fact, it was an interview with Blaine Harden about Escape from Camp 14. (You can listen to it here.) To top it off, Harden was going to be speaking at Seattle’s town hall in the coming weeks. The topic of North Korea’s labor camps was getting hard to ignore. I may not be the quickest person when it comes to the Holy Spirit’s guidance, but this seemed pretty obvious. At our next editorial meeting, I shared my experience and we determined to move ahead with an article on North Korea. We later received further confirmation of the importance of this topic when Voice of the Martyr’s focused on North Korea in their May 2012 newsletter and when 60 Minutes ran a feature on this same topic. Truly, the eyes of the world are turned toward this great injustice against human freedom. The March article from the 2013 Personal Prayer Diary is reprinted below. Please join us in praying for North Korea’s prisoners. 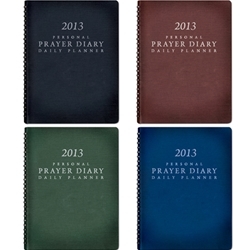 And if you haven’t already, pick up a copy of the 2013 Personal Prayer Diary and Daily Planner today. There are many other important topics for prayer. January’s focus is on unrest in Sudan and the newly formed South Sudan. February features an article by author Chai Ling on gendercide in China. That’s just a start! Chun-hei worked silently at her sewing machine. She had lost what narrow freedom she had when she was thirty years old. She was imprisoned without trial when authorities found out about her belief in God. Chun-hei now lived inside a North Korean forced labor camp, hidden deep in a valley in a northern province. She worked in a textiles factory, sewing military uniforms alongside hundreds of other women. Though hungry and exhausted, she dared not complain or she would be beaten with a wooden stick, or worse—executed in front of thousands of witnesses. She herself had witnessed such executions and was deeply disturbed. Who will save me from this hell on earth? she wondered. The communist state of North Korea came into existence in 1948, when the Korean peninsula was split between north and south. Under the leadership of Kim Il-sung, the North Korean government tightly controlled the affairs of the people and promulgated its superiority and the godlike status of its leader through widespread propaganda. Kim Il-sung died in 1994, and his son Kim Jong-il assumed full leadership, having been designated his father’s successor in 1980. Kim Jong-il continued his father’s policies of self-reliance and military power. North Korea’s leadership changed again in December 2011, when Kim Jong-il died and his youngest son, Kim Jong-un, ascended to power as the “supreme leader.” In a 2012 speech Kim Jong-un reemphasized North Korea’s “military first” policy. Although life for “free” North Koreans is difficult and oppressive, it is far worse for North Korea’s political prisoners. Some 200,000 people live inside five large labor camps in remote, mountainous areas. Though the existence of the camps is officially denied by the North Korean government, the camps are clearly visible and identifiable on Google Earth. The forced labor camps, known as gwalliso or kwan-li-so, are likened to the Stalinist prison-labor camps of the former Soviet Union, and they have existed for over fifty years. Life inside the labor camps has been described by numerous escapees and documented in detail in The Hidden Gulag: “The most salient feature of day-to-day prison labor camp life is the combination of below-subsistence food rations and extreme hard labor. In a system of intentional, administratively inflicted hunger, the regimen of chronic semi-starvation provides only enough food to be kept perpetually on the verge of starvation. Prisoners are driven by hunger to eat, if they can get it (and avoid being caught), anything remotely edible: plants, grass, bark, rats, snakes, the food-stuffs of the labor camp farm animals. . . . In the book Escape from Camp 14, journalist Blaine Harden relates the story of Shin Dong-hyuk, who was born in a prison camp and escaped at the age of 23.6 The book details not only the physical oppression of prisoners but also their psychological oppression in an atmosphere of fear, distrust, and hostility. Prisoners are kept under constant surveillance and are frequently beaten by guards. Female prisoners are sexually exploited or raped. Prisoners who report fellow inmates’ wrongdoing, such as stealing food or plotting to escape, are rewarded with food; those who are found not to report such activities are executed. And prisoners who volunteer to bury dead bodies are rewarded with a rare bowl of rice. Such horrible realities must be met by firm political action and much prayer. But the prison camps are not the only reality of North Korea. In the 2011 edition of the Personal Prayer Diary and Daily Planner, David Ross highlighted the “remnant church” that exists in North Korea and the hope for revival. Isaiah 9:2 says, “The people walking in darkness have seen a great light; on those living in the land of deep darkness a light has dawned.” Let us pray that the light of the Prince of Peace will shine on all North Koreans—and especially those 200,000 individuals in the prison camps. 1. Peter Foster, “North Korea Faces Famine: ‘Tell the World We Are Starving,’” The Telegraph, July 16, 2011, http://www.telegraph.co.uk/news/worldnews/asia/northkorea/8641946/North-Korea-faces-famine-Tell-the-world-we-are-starving.html. 2. Louisa Lim, “Malnutrition Stunts Growth Of N. Korean Children,” NPR, June 12, 2012, http://www.npr.org/2012/06/12/154872720/malnutrition-stunts-growth-of-n-korean-children?ft=1&f=1004. 3. David Hawk, The Hidden Gulag, 2nd ed. (Washington, DC: U.S. Committee for Human Rights in North Korea, 2012), 25–27. 6. Blaine Harden, Escape from Camp 14: One Man’s Remarkable Odyssey from North Korea to Freedom in the West (New York: Viking, 2012). © 2012 by YWAM Publishing. All rights reserved.